The South Winnipeg Community Centre is set to drop the puck for Winnipeg’s first all-female outdoor hockey tournament. The Winnipeg Storm Winter Classic runs Jan. 27 to 31 at the Waverley site of the community centre at 1885 Chancellor Drive. More than 20 female hockey teams and 330 players will take to the ice in what organizers are calling the province’s only all-female hockey event. 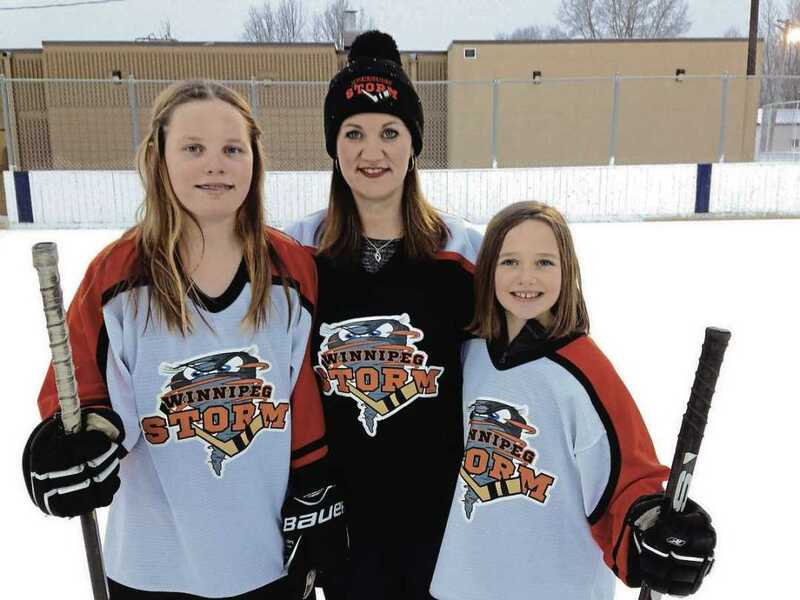 “People are excited to have a venue in their own city where they can come and showcase female hockey in an inexpensive way,” Nicole Carnegie, marketing and events manager for South Winnipeg Community Centre (SWCC), said. Hosted by the newly minted Winnipeg Storm Female Hockey program, of which Carnegie is also vice-president, the tournament will showcase the talents of Manitoba’s novice and atom girls’ teams, employ a group of female timekeepers, referees, and linesmen, and will wrap up with a dance party and pancake breakfast for participants. “We’re really trying to have it be an empowering thing,” Carnegie said, adding that there will be specially branded merchandise and accessories for girls available at the event. The tournament will also offer a beer garden on Friday night, floor hockey indoors for the kids, and the community is invited to watch the tournament and become acquainted with the new Winnipeg Storm. The South Winnipeg Hockey Association partnered with the Fort Garry North Hockey Association last September to create Winnipeg Storm for all female players in the two associations’ catchment areas, not including AA. The new team name was created in response to a growing demand for female hockey programming in the community and a consistent identity, Carnegie said. Prior to the rebranding, team names alternated between South Winnipeg Kings and Fort Garry North Flyers each year. “It made for a real feeling of detachment that nobody had a brand for themselves,” Carnegie explained. Winnipeg Storm includes players from the novice level up to midget and Carnegie said there’s more room for growth as the program develops. For more information about Winnipeg Storm or the inaugural Winter Storm Classic, go to www.swha.ca or call 204-269-7000. Supplied photo: The South Winnipeg Community Centre will be home to Winnipeg’s first all-female outdoor hockey tournament, organizers say. From left, participant Meagan Carnegie, Nicole Carnegie, Winnipeg Storm Female Hockey vice-president, and participant Victoria Cabral.